This week, I finally finished a piece I’ve been working out for what seems like forever! I have decided to return to my interest in vessels and develop some new forms for pendants. Working on this tiny scale leaves little room for mistakes. One too many glides of the file can shift the angle of the curves irreparably. Pouring spouts are especially tense work… but I got there! I also enjoyed working on a new style of clasp. It is easy to close and easy to see – the chains are attached off-centre on this piece so the clasp hangs on your chest rather than the back of your neck. I’ve been making the Rolling Ball kinetic rings for a while now – decided to add a bangle to the series. Pendant might be next… watch this space! I spent a long time considering the possibilities of single surface forms, both for kinetics and for jewellery. I studied the mobius strip and applied it to a 3-dimensional line rather than a 2-dimensional one (such as the common use of paper strips). The Möbius strip is a single surfaced form. It can be made by taking a strip of paper, doing a half-twist and joining the two ends to close the curve. With this bangle I used square wire. I did a 3/4 twist and added moveable charms to help illustrate the never-ending surface. After 4 times round the bangle they will return to their original spot as would the ant. So so excited to see my work in Crafts Magazine! Chuffed to announce that I have been accepted onto the fabulous Crafts Council Hothouse scheme! I will be taking part from January, and am flattered to have been selected. 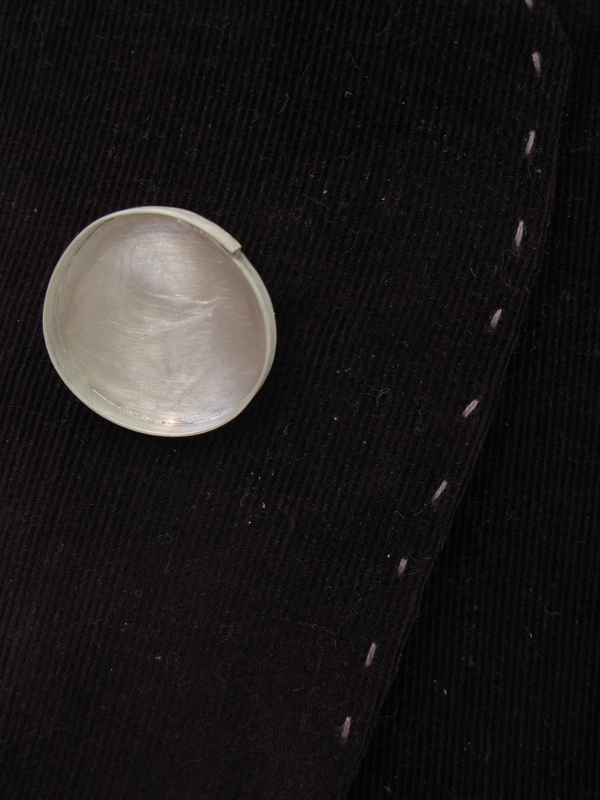 Organic forms pierced into walled brooches – the negative space within the brooch shows the colour of the fabric it is worn against. Have made a lavender brooch for a relative who loves purple – Have also had commissions offered with personalised forms requested. I am enjoying playing with brooch designs at the moment and have produced some with and without pierced designs from the surface. The negative space from the pierced shape allows the colour/pattern of the fabric behind to show through.